Cankarjev dom – Cultural and Congress Centre Ljubljana (CD), one of Slovenia’s largest convention centres, has been for almost 40 years the legendary institution and a synonym for cultural and humanistic activities and meetings industry in Slovenia. Here are some of the most popular stories about CD published in 2018. Uršula Cetinski has been the Director General of Cankarjev dom – Cultural and Congress Centre (CD) since 2014. Her professional (and educational) background is very much connected to arts and culture. 21st Slovenian Family Medicine Days (or Days of Schrott) were on 16-17 March again hosted by Cankarjev dom – Cultural and Congress Centre. Cankarjev dom – Cultural and Congress Centre Ljubljana (CD) in cooperation with the Ministry of Agriculture, Forestry and Food, the Municipality of Ljubljana, the Embassy of Switzerland and BTC plc. organises and hosts the WORLD BEE DAY on 20 May 2018. Cankarjev dom – Cultural and Congress Centre Ljubljana will on 12 May at 7pm host one of the world’s bestselling crime writers of all times. Cankarjev dom – Cultural and Congress Centre Ljubljana will between 4 – 5 June host the EURELECTRIC Annual Convention & Conference 2018. Cankarjev dom – Cultural and Congress Centre Ljubljana boasts the only arena stage in Slovenia. The Štih Hall (Štihova dvorana) takes its name after a Slovenian literary critic, essayist, stage director, and editor, Bojan Štih. 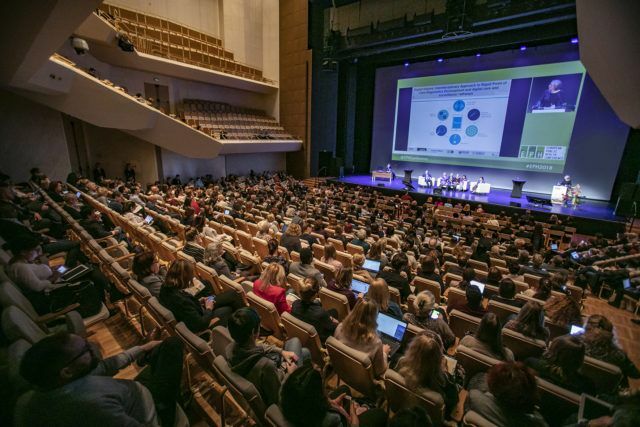 Cankarjev dom – Cultural and Congress Centre will between the 28th of November and the 1st of December 2018 host the 11th EPH – Eureopan Public Health Conference and its 1500 international delegates.